In the real world, giving up your cash for The Man in the form of taxes can feel rough. Nobody wants to give up what they’ve earned – in the spirit of breaking the real-world rules and appealing to your sense of fantasy, GTA Online is giving out tax refunds to the tune of $250,000 over the next week. That’d be nice, wouldn’t it? In case you’re a dirty, dirty cheater, here’s some of the console commands you can use in GTA V to have a bit of fun. If you logged in between February 16 and February 26, the 2018 San Andreas State Tax Refund of $250,000 will appear in your GTA Online account between now and March 6. There’s also a 10% rebate, up to $1,000,000, depending on how much you spent in the game in the last 10 days. There’s also a special new car coming out, although it’s possibly familiar to lots of people. The Pfister Comet SR is the sports equivalent of the Pfister Comet, described by the GTA Online blogpost that announced it as a “race-tuned bullet is built for only one thing: to make everyone else look like the asthmatic kid in gym class.” Very GTA of them. Gunrunning Sell Missions, Special Vehicle Mission, Air Quota, and Rockstar-Created Transform Races are all giving double cash and RP this week too. There’s also a series of discounts on vehicles, aircraft, and certain facility upgrades this week, you can see the full list on their site. 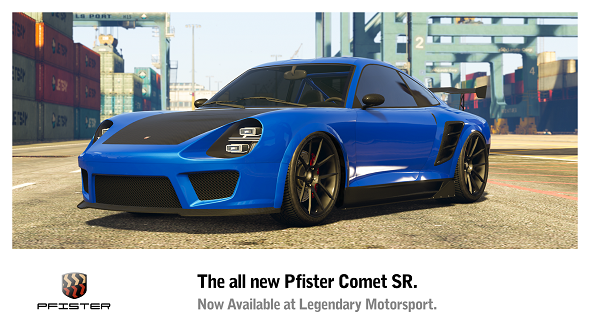 All of this should be live now, so if you really want to pick up the Pfsiter Comet SR, you can do so from Legendary Motorsport in-game now.